Our American English month is shortly coming to its end. Perhaps this is a good point to stop and ask this question again: What is American English? This time the answer comes from Robert Lane Greene, journalist, blogger and author of a soon to be published (and now thoroughly copy-edited) book, You Are What You Speak, about language and identity. I first discovered Labov’s work in particular while researching my own book about language and identity. One of the founding fathers of sociolinguistics, Labov sought to explain variation in American English. His master’s thesis was on a distinctive vowel on Martha’s Vineyard, the storied island off the coast of Massachusetts. (Roughly, the native pronunciations of the diphthong in “ride” sounds a bit like some Irish pronunciations of the same.) 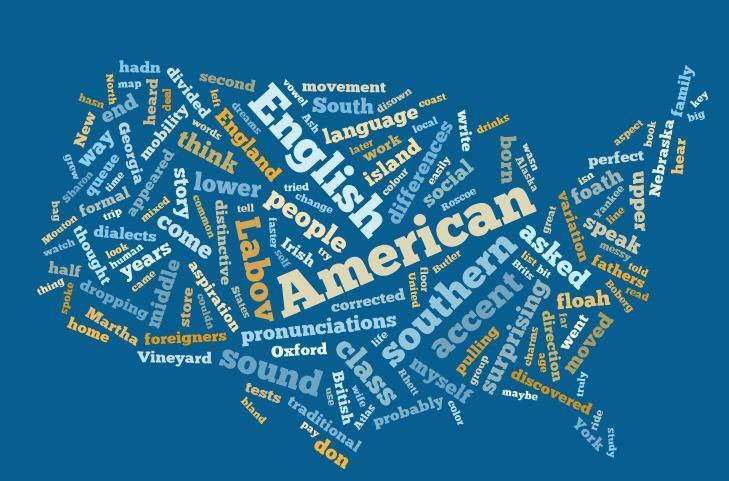 Contrary to the hypothesis that American English is drifting towards a bland Network Standard, Labov found (in the 1960s) that this distinct Martha’s Vineyard pronunciation was increasing, and asked why. It turned out to be a sociological variable: that those with the strongest attachment to the island’s traditional ways—often fisherman annoyed with the “summer people” who had recently discovered the island’s charms—moved their accent further in the direction of the traditional one, probably unconsciously. Labov went on to do an ingenious study of New York English. He found that the “r-dropping” characteristic of that accent was more common in a lower-end department store than in a higher-end one. (In the lower-end store, when he asked people the location of something on the fourth floor, they were more likely to tell him it was on the foath floah.) So far, so unsurprising. He also found that if he asked them to repeat themselves, pretending he hadn’t heard, the r was more likely to appear the second time. None of this was surprising either. He further went on, in separate testing, to show that the r appeared more often when people read words off of a list and did other formal tests than when they spoke spontaneously. This wasn’t too surprising either. But one surprise did come when he compared the difference in how much different classes “corrected” themselves. Everyone was more likely to pronounce the r in formal settings. But the lower-middle class corrected themselves even more than the upper-middle class did, relatively speaking. Labov posited “hypercorrection”—the aspiration of those in a lower-status group to try to sound more upper-class. Those already in the upper-middle class were more content with where they were, r-dropping and all. Why go on about this? I think that the variation that Labov and others put their finger on is so interesting because mobility is such a key aspect of the American life, both geographical mobility and, at least in our American dreams, social. We do move around the country a great deal, much more than Europeans do. People also do move up and down the social ladder, and even those who don’t think they can and will. How accents and dialects change along with that movement can be fascinating to watch. I was born in Tennessee, and grew up in Arkansas, Nebraska and then, mainly, Georgia. I remember moving to Atlanta at age 8 and beginning, self-consciously, to use “y’all”. We hadn’t said it in Nebraska and it came haltingly to me. I settled down into a lightly southern-inflected English there, with a Georgia-born father who said rassle and brefuss (for “wrestle” and “breakfast”) pulling me in one direction, and a Wisconsin-born mother pulling me in the other. My southern family always thought I (and my brother) sounded northern. Imagine my surprise on coming to graduate school in Oxford, years later, and being considered the local southerner; people told me again and again they could hear a southern accent in me that I couldn’t hear in myself. I had half-worried that my southern family back home would really disown me if they heard me come out with a “queue” or a “motorway”. Now here I was in England sounding like Rhett Butler (or maybe Roscoe P. Coltrane – the class differences in southern accents are underappreciated by outsiders) to the mixed bag of Brits and foreigners at my college. From Oxford, I moved to New York—foath floah and all. It hasn’t left too much of an imprint on the way I speak, except that I probably speak faster than I do down South. But the triangular trip from the south to England to the northeastern United States has made it so that when I think about it for just a second, everything sounds foreign or put on—including myself. My wife, Scandinavian, often says that I get more southern when I get excited or strident (or when I have a few drinks). But friends sometimes ask me why I don’t have a southern accent, and all of a sudden I truly can’t sound neutral to myself; either I sound too Yankee or too southern, and nothing is me. My story isn’t so unusual. In a way, I’m a perfect American, just like that Italian-American from Michigan Madonna is a perfect American, with the half-British diction she’s been mocked back home for after years of living in England. To move between accents and dialects is part of human language behavior. But to me it seems poignantly and particularly American, with physical movement and social aspiration so big part of the national story. An American can be someone who says y’all come back or foath floah, or, just as easily, someone who has tried them both and more. I spent 10 weeks in Long Island, New York when I was sixteen and since I already could communicate fairly well in English I benefited from my stay by acquiring a good American accent (in my opinion and that of others). When I came back to my country, Chile, every time I met an American he or she would say they said I spoke as a New Yorker (and they dropped the “R”). I was young, and I felt really proud. Through the years I guess I sort of lost my accent a little bit but still native speakers in England asked me if I was American and Americans would say I had a “European accent” (whatever that means!). Anyhow, I’ve been teaching English for many years, therefore my pronunciation has become more careful but I would have never expected anybody to say I had an English accent and that’s what a young British colleague said to me a few days ago! I don’t know what to say… I truly loved my American accent! I spent my earliest linguistic years in Georgia and then moved to rural North Carolina at age 7, where everyone made fun of my accent. I lost that one and didn’t leave NC until I graduated college and moved to New Mexico, where I proceeded to pick up some of the regional linguistic flavor. Now I’m out in California where my accent is a bit more “neutral” i.e. Midwestern sounding, however people here don’t realize there is a California accent too. Observant people can still hear my Southern twang and I’ve also been told it comes out when I’ve been drinking or I get strident, but also when I’m talking about family or cooking, and especially when I come back from holidays in North Carolina. However, when I spent a week in London, as someone who is good at accents and also a long time viewer of a variety of BBC TV shows, I had to actually work to stop myself from automatically repeating back the London accent I heard around me. I knew it would just sound at best odd and at worst pretentious or even mocking. Language, I love it.